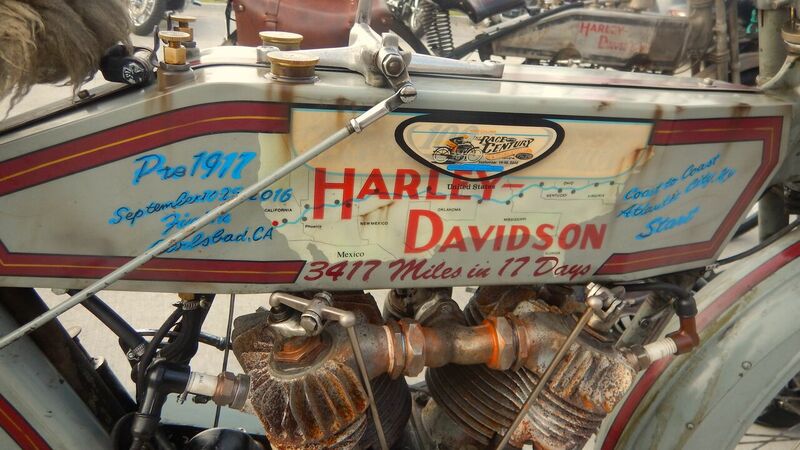 Motorcycle Cannonball: Day 9 | Hupy and Abraham, S.C.
After a day of rest, people were ready to get back on the road. During the “rest” day, competitors and crew worked hard on the bikes to get them ready for the seven days that remain. For some it was stressful. So much to do in so little time; Engines were rebuilt, chains replaced, fluids and bearings replaced and more. The weather cooperated with temperatures in the mid-80s and dry conditions. We stayed in three different hotels in three separate locations. Everywhere I looked people appeared to be busy in an organized routine. I rode around town stopping at several stores to stock up on smart water, bandages, and when I returned, I re-stocked the first aid supplies in the support vehicles. I made a few “house” calls for some minor health issues, and everyone was ready for another day on the road. Today, we awoke to thick fog. It was still dark when the first bikes went out at 7:45 am. They typically don’t have much for lighting, and with such a small profile the riders do what they can to make themselves visible. The official starter, Cole Dister, dressed as the grim reaper this morning, having a little fun with his dark humor. Today’s route takes us from Dodge City to Pueblo, CO. Elevation will increase from 2,400 to 5,000 feet but we won’t be in the mountains yet. I visited with Scott Byrd, #25 from Arkansas before he rode off, admiring his daily cheerfulness. On the last Cannonball in 2014, he rode for his sister who had passed away, telling me that he did this for her because she couldn’t. His brotherly love touched my heart. This Cannonball he is wearing pink with his long hair and tattoos. His bike is painted with pink accents. I asked if this bike was also named Kimberly and he said, no, this is Gypsy. Her parts have come from all over the USA. I asked if all of his 10 bikes had names and he said no, they reveal themselves to him at some point but some had not done that yet. He then showed me a Tattoo with all of his bikes listed. Yes, he’s one of the unique personalities that make up the Cannonball riders. Good luck Scott! I didn’t see the usual scattering of broken down bikes today, common in the first 20 miles. The fog was lifting and the cool dry morning air was welcome. Traffic was not heavy, but with a speed limit of 65 mph, it’s a bit scary to see the big trucks passing these little motorcycles. 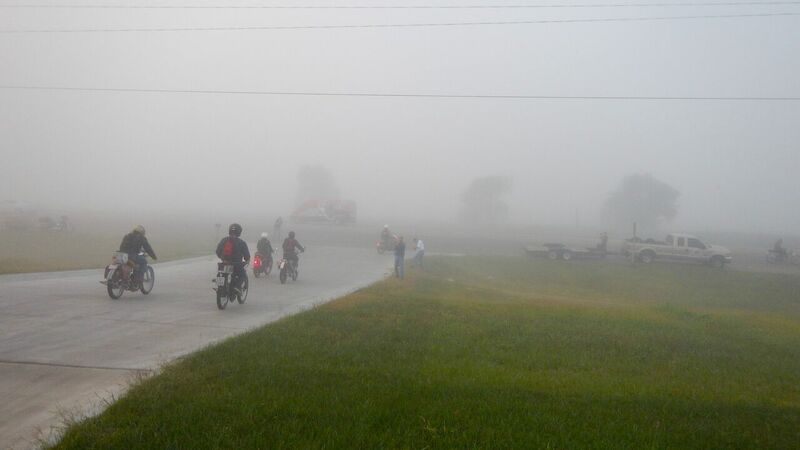 It’s obvious they couldn’t see the little bikes in front of the line of vehicles that bunch up behind the slower moving motorcycles, so I flipped my strobes on and waved trucks attempting to pass back in behind me in order to avoid disaster. 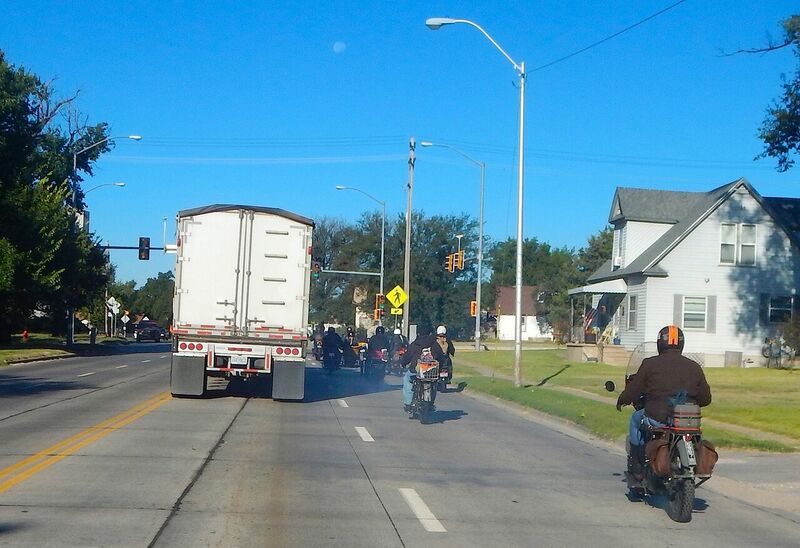 As we continued the traffic got lighter and the grouping of bikes started to spread out. Still, like a bunch of hornets, the bikes would gather at gas stations to the delight of locals. One woman grabbed my arm and exclaimed, “Did someone call the newspaper”? I smiled and told her what a special event she was witnessing. At the next gas stop I saw a reporter with paper and pen in hand talking with some of the riders. I feel so honored to be able to be a part of this. 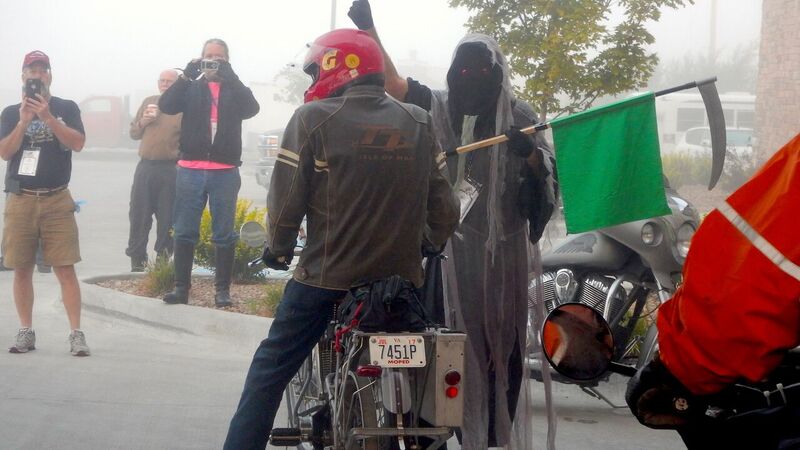 One rider needed help with a push start. There were some guys gawking at the bikes so I asked them to help him knowing they would be talking about how they helped for the rest of the day. The afternoon temperature was in the mid-90s and there was no getting out of the blistering sun. It made the last 60 miles feel like an eternity. We could see the mountains in the background. I stopped at more road art and contemplated what would make a person create such a thing. It had the same look and feel as the Kansas road art with political statements and bizarre fabrications. I wondered what the person looked like that created this. We ended at the Marriott Courtyard where, as usual, a crowd had gathered to welcome the riders. 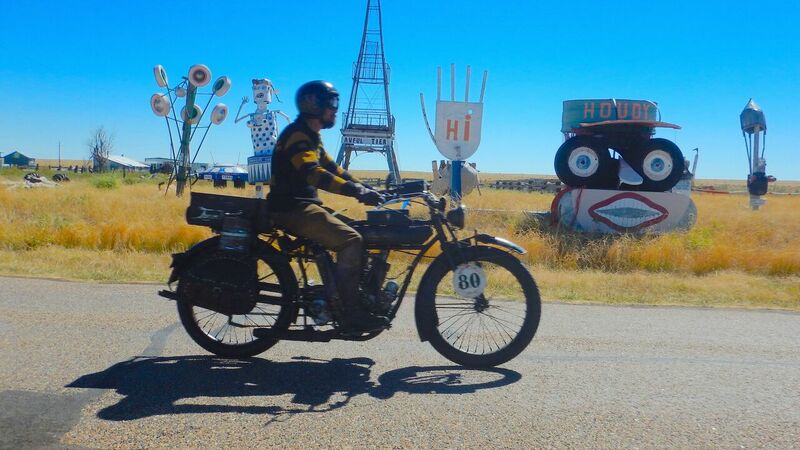 At the day’s start, 71 bikes and riders left Dodge City. Not all of them finished the trip under their own power. The chase trailer had come in with bikes on it and some had been picked up by their support crews. One of the riders that had broken down told me he was done and the bike’s engine just could not go on. I was sad for him. He had so much invested. I hope he stays to enjoy the rest of the trip and help with other bikes at night. There is always something to do, and the Cannonball riders are a sort of community, watching out for each other and lending a hand where they can. Several riders who are out of competition have remained with the group to do just that. Tomorrow we get into the mountains. Should be interesting!